This summer, Hasbro launched a new game that combines two stacking games that are icons in their own right. As you might guess from it’s name, Jenga Tetris is a fun new stacking game that comes when you combine the strategic piece pulling and stacking of the JENGA tower with the familiar shapes of Tetris. Anyone else hearing the Tetris music right now? 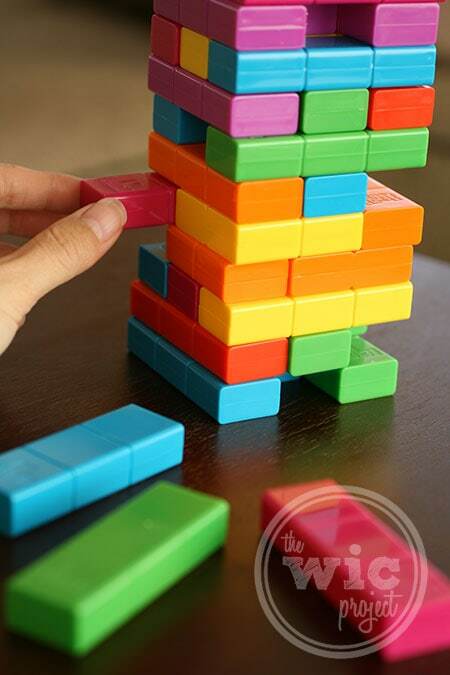 As you assemble the tower, each layer may have gaps, especially if you’re using the zig zag pieces. Don’t put the pieces so there’s a piece point up or down into the next layer, otherwise that piece will be (virtually) impossible to remove. After your tower is built, it’s time to start pulling, pushing, and placing the Jenga Tetris blocks. I loved how you the strategy becomes a little more difficult with the Tetris pieces. You can’t always tell if the piece you’re trying to remove is a straight piece, an L-shaped, or a zig zag shape, so sometimes you may find yourself looking around the corner of the tower to get an idea of which piece you’re going to remove. After you’ve successfully removed the piece, place it on the top of the tower and keep going. 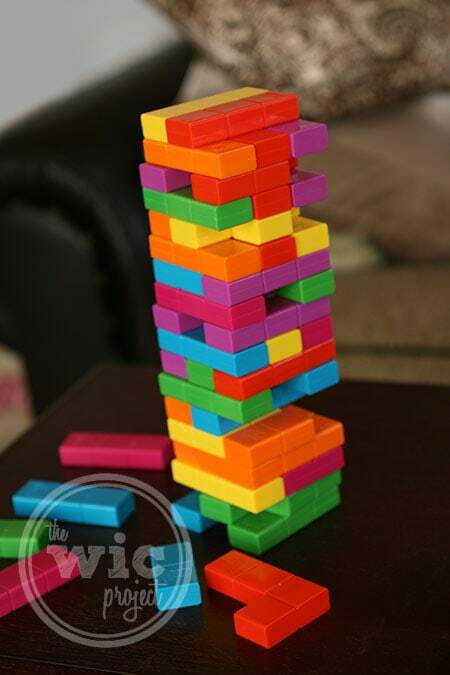 With color blocks, you can add fun twists to your Jenga Tetris game, like completing a whole layer of the same color allows you to choose who goes next. 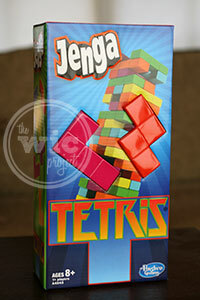 Jenga Tetris is a great game for families and kids over 8 years. The colors are bright, the pieces are different shapes, and the whole game seems younger and more “hip.” Want the game? Jenga Tetris is available in-stores now, as well as online from Amazon for just $17.29. We’re doing this giveaway a little differently to try and get this prize to the winner before the holidays. 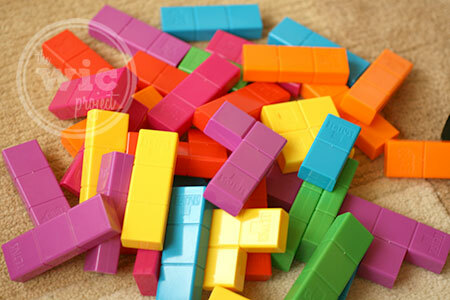 Just comment on our Facebook post (either from our Facebook page or using the embedded post below) telling us what you love about Jenga Tetris. By commenting and entering, you agree to the promotion rules, terms, & conditions (http://bit.ly/wicproject-jenga-tetris-ga-rules). This giveaway is open to eligible US residents, ages 18+ and starts now. This giveaway ends on 11/27 at 11:59PM MST. 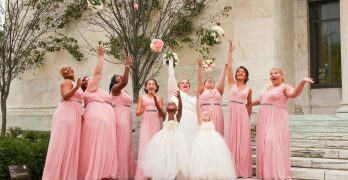 Winners are chosen at random from eligible entries. Post by The WIC Project. I love this game. 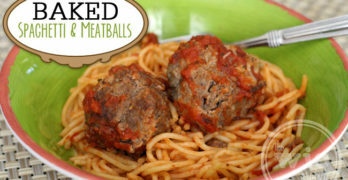 A fun game to play with family and friends. I haven’t played this game but I enjoy playing Jenga so I will most likely like to play this. Thanks for the review. My husband loves Tetris & I used to like playing Jenga. I see a gift idea now. Thanks.